160km winner Jenny Champion and Freckles at the finish. 101km winner Murray Smith and Glemmore Toy Boy. By the sixth and final lap Jenny had victory in her sights, starting just four minutes in arrears of leader Linda Kenney on PL Mississippi. She set out at a blistering pace, galloping down Kenney. With Mark Tylee on Cyden Kay just a few minutes behind, Champion was under pressure to keep the lead. She finished the last 11km in a slick 26 minutes 23 seconds, finishing with a total ride time of 10 hours 43 minutes and 13 seconds. Tylee moved up on the final lap to take second 12 minutes later, with Kenney content to finish third in just her first attempt at 160km on Mississippi PL. Champion was also awarded the trophy for Best Conditioned horse. • Fresh from a third at the North Island Championships in January, Mangaweka farmer Murray Smith riding the eight-year-old Glemmore Toy Boy put up a strong performance to win the CEI** 101km Championship. Smith dominated from the start being chased hard throughout by international Paul Jeffrey on Renegade, second. Kirstin Duess of Aspen Hills Arabians came home third on Pacifica, with Toni Bryant and Frontier, fourth. Smith was later awarded the prize for Best Conditioned also. 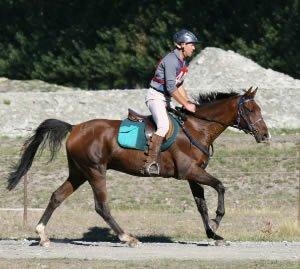 In the CEIJY*** 15-year-old Jamie Heywood took the honours and Best Conditioned Award riding Zaandel NZL. With just the four starters it was close throughout, but at the end Heywood was the only one to finish with both Kirsty Higgins on Glitter N Gold and Helen Graham on Sherwood Sariah vetted out at the final vetting. 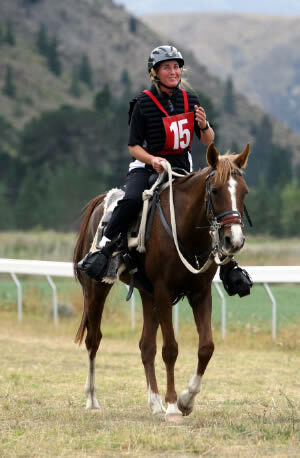 The 101km Junior Championship went to Kimberley Ryan on Kevin James' Diam'id in spectacular fashion, Ryan falling from her horse at the end of a long gallop finish against Julia Anderson on SS Shalia. Anderson was subsequently vetted out in the final vetting, opening the door for 11-year-old Georgia Smith on Aurora Australis to take second. Brooke Candy riding the 12-year-old mare, Fahana, finished third, with Tarnia Kittel on CD Proud Mary, fourth. Kimberley and Diam'id were also awarded the prize for the Best Conditioned.